A few days ago I wrote about Goldsmiths Islamic Society’s (ISOC) attempts to have Maryam Namazie disinvited from a talk arranged by the Atheist, Secularist and Humanist Society (ASH). The ‘reasons’ put forward by ISOC were the usual collection of smears and hyperbole bolstered by co-opting the language of certain regressive principles – namely bleating that their ‘safe space’ had been violated. 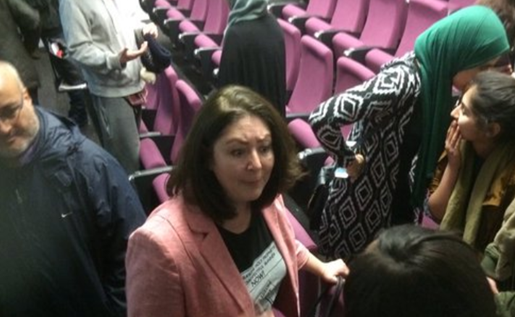 Despite all their bluster on social media, no official complaint was received from the student union and Maryam Namazie’s talk went ahead as planned. I previously accused ISOC of attempting to enforce Islamic blasphemy laws on campus, rather than having sincere concerns about ‘safe spaces’, and this latest bout of behaviour seems to confirm this beyond doubt. After my talk began, ISOC “brothers” started coming into the room, repeatedly banging the door, falling on the floor, heckling me, playing on their phones, shouting out, and creating a climate of intimidation in order to try and prevent me from speaking. I continued speaking as loudly as I could. They repeatedly walked back and forth in front of me. In the midst of my talk, one of the ISOC Islamists switched off my PowerPoint and left. The University security had to intervene and remain in the room as I continued my talk. Eventually the thug who had switched off my PowerPoint returned and continued his harassments. At this point, I stood my ground, screamed loudly and continued insisting that he be removed even when the security said he should stay because he was a student. Another CEMB [Council Of Ex-Muslims] activist said one of the ISOC thugs disrupting the meeting threatened him by pointing a finger to his head. Goldsmiths Islamic Society (ISOC) would like to categorically condemn the vile harassment of our ISOC members (both male and female) by the Atheist, Secularist and Humanist Society (ASH). On Monday 30th November, students of Goldsmiths University, alongside members of the public attended an event organised by the ASH titled “Apostasy, Blasphemy & Free Expression, In the age of ISIS”. The ASH invited Maryam Namazie, who is known as a notorious islamophobe to speak at the event, despite our polite request for them to reconsider. The university should be a safe space for all our students. Islamophobic views like those propagated by Namazie create a climate of hatred and bigotry towards Muslim students. Muslim students who attended the event were shocked and horrified by statements made by Namazie, and peacefully expressed their dissent to the disrespectful cartoons shown of the Prophet Muhammad (pbuh). These students were subsequently made subject to unnecessary bullying, abuse and violence by the ASH society and security staff. Some students were even forcibly removed from the event. Following the event, members of the public who were present at the event have been tweeting unauthorised pictures of our University students with fabricated statements regarding false allegations of “death threats”. We would like to make it very clear that Muslim students did NOT make any alleged “death threats”. This is a fabrication made by supporters of the ASH and Namazie in an attempt to distort the truth and further marginalise Muslim students for expressing dissent at offensive statements and images. A university should be a safe environment/space for all students including Muslims in this sensitive time. Hateful statements that encourage Islamophobia by Namazie and the ASH can lead to very serious & violent consequences towards the Muslim students at the university. A university institution needs to prioritise the safety of its students and take action to ensure students are not harrassed/intimidated online or on campus. 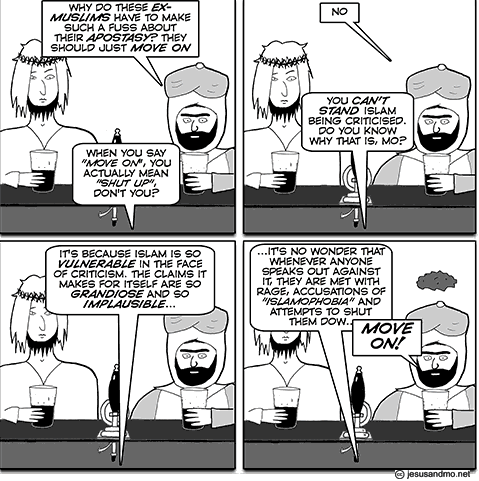 Let this sink in: At a University in London in 2015, some Muslims think it’s acceptable to enforce Islamic blasphemy laws – in response to cartoons. These theocratic bullies aren’t ISIS, Al Qaeda, or Boko Haram – but privileged, British students in the English capital. We have a serious problem. And as if solely to prove their redundant absurdity, Goldsmiths Feminist Society release a statement in solidarity with ISOC. This is the same ‘Feminist’ society that disinvited comedian Kate Smurthwaite from a planned gig due to complaints about her ‘Islamophobic’ material. Before cancelling her, they had initially warned her that she must maintain their ‘safe space’ by not disagreeing with certain views the Feminist society were ‘for’. I’m not joking. A pervasive strain of toxic western feminism is on show here. It seems they hold two books for equality: One for themselves, and one for the browner, less ‘them’ people. Like Namazie, they should be screaming from the rooftops about the oppression visited on women in the name of Islam. Instead, we have an instance where a group of men openly harassed and intimidated a woman minority (Iranian ex-Muslim), and the feminist society chose to stand with her aggressors. ’Feminists‘ siding with Islamists is akin to PETA sponsoring your local steak night. This is an utterly shameful display of moral confusion. Video of Maryam’s talk should be released in the coming days, which should paint a clearer picture of what occurred and enable the relevant authorities to take action if necessary. Universities need to make it crystal clear that the U.K is not beholden to any tenets of sharia and that free speech is more important than hurt feelings. These principles transcend any ‘cultural sensitivity’. Our institutions and society at large need to challenge this kind of behaviour in the strongest possible terms, wherever they encounter it and nurture a climate where engaging in this deplorable manner comes with a lasting cost for one’s reputation. UPDATE: Video of the event can now be viewed here. It wasn’t until I recently started following your blog (and listening to your excellent podcast) that I became aware of what was actually taking place in our universities,even though it makes for some thoroughly depressing reading, please keep up great reports. And is there any chance you will be posting a link to the video of the talk by Maryam Namazie,when and if it becomes available? Students should feel safe at their university, but the entire university is not a “safe space.” You go to a university to learn and grow and have your ideas challenged, not to be reaffirmed. What would violate the Muslim student’s safe space is if the atheists went into one of their meetings and started telling them how wrong they are. Being criticized by an ex-Muslim is not violent hate speech. 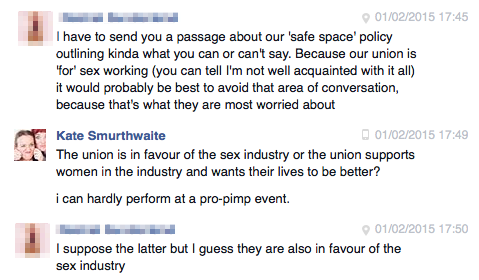 Sometimes I find you go too far against safe spaces and trigger warnings; this is not one of those times. However, I think you should listen to the discussion on this week’s Cognitive Dissonance (Ep 262) for a good discussion on why they are sometimes needed. These are not true feminists that’s for sure. I would not feel safe in an environment which allows the Misogyny of Islamists to go unchecked! Apparently what you need to do to shut this lot up is say you’ve memorised the koran. That guy and the Libyan lady were highlights. Its a pretty excruciating 2 hours because of all the interruptions, but does get better towards the end with Maryam eventually being allowed to make some good points. It shows how corrupted the freedom of universities has become. Muslims for some reason believe that a ‘safe space’ equals no questioning of bad ideas. Well, it’s not. The more Muslims are starting to push recently, the firmer the resistance will become. I don’t need blasphemy laws or bigoted 7th century patriarchs determining what women wear. Neolibralism is a cancer and these liberal ‘feminists’ are a disgrace. There’s many radical feminists on twitter calling them out for this BS. Goldsmiths Feminist Society – a huuuuuge waste of a fine education on numpties. You couldn’t make these females up! York University feminists recently got a Men’s International Day event cancelled. The far left are the modern day nazis who try and silence reasonable middle ground debates. An extreme on left or right is bad. What I find most disgusting is the Goldsmith’s feminist and lgbtq societies stood in solidarity with the dictionary definition of an oppressive, mysoginistic, homophobic patriarchy… against a feminist. Earlier this month at Goldsmiths University of London, a female ex-Muslim speaker named Maryam Namazie was invited to talk about Islam and her reasons for leaving the faith. Her invitation was protested formally by an on-campus Islamic group (ISOC), who even sent a contingent of members to the lecture in order to subvert it. The event-hijacking happens gradually starting at the 7-minute mark in the video found via the link below. So far, none of this merits much attention: it’s the expected in-fighting between adherents of a faith and ex-adherents who threaten the former’s coherency as a group by showing its members a way out. But that all changed once the ISOC alleged that Namazie’s talk would be filled with hate speech and would only incite more Islamophobia on campus. Everything changed because this allegation successfully made the ISOC look like victims, and everything changed with this depiction of victimization because the university feminist and LGBT student groups bought it. What followed were two official statements of support from the Goldsmiths Feminist and LGBT societies and in its wake an unholy marriage between a group (ISOC) that opposes gay rights and believes that feminist beliefs enslave women, on the one hand, and on the other, two groups that believe exactly opposite things. What’s most interesting to me in all of this is how to explain it, and I think I’ve made some headway. The explanation centers on two preconditions, preconditions that are required for this uneasy cohabitation of ideological antipodes to be conceivable: 1) A belief that discourse about ideas is best understood as a discourse about power (postmodernism); and 2) A belief that right action is not best determined through appeal to universal principles of justice, but is instead always a practical question of how to give care to those who are in immediate need of it (feminist care ethics). On #1, postmodernism has asked us to look at questions of theoretical dispute in terms of a struggle for power instead of as a struggle for truth. When we do this, we stop asking questions of the beliefs surrounding us like “What is true and/or good?” in the interest of hitching our wagons to the right horse, and instead we replace those careful questions with the hastier one of who is locally in a position of power such that s/he can affect the beliefs of others? Nowhere is it then also asked whether implementing this belief would be good or bad, only whether s/he has power enough to do it. And on #2, feminist care ethics is built on the idea that traditional ethics has gone wrong in trying to mete out justice according to universal rules that rank needs in hierarchies of value, and have asked us to focus instead on giving care to those in the greatest need, to those of us who are victims. This is great in theory, but the general disregard for careful analysis in care ethics makes it hard to figure out who’s really being victimized and who’s crying wolf, and in some cases this approach winds up making a virtue out of just giving grease to the squeakiest wheel. To all of this I really only have one thing to say to the feminist and LGBT groups to dissuade them of their perhaps unacknowledged commitments to 1) and 2) above, that in addition to our legitimate concerns about the danger of power and about the pressing needs of victims, we should also always ask ourselves this question: would the world be a better or worse place if the people we support were in charge? Let us not just side with whoever has less power in our vicinity, as postmodernism and care ethics would have us do, but ask ourselves what they would do if they had power, so that we may judge their beliefs more conclusively. In short, let us be activists in the moral sphere as we are activists in the environmental: let us think globally before acting locally. Simply wow! So all those people on the right who were disparaging feminists for being bullies and anti-liberal are right after all? Looks like the ideology of postmodernism has hollowed their brains out. So are they saying that Islamic fascists are right because they are powerless? Makes no sense to me. They are not even powerless. They have the same rights and opportunities as any one of us, living in an egalitarian society.